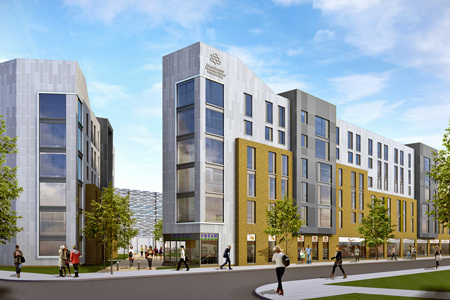 With only 12 months to go until our Birley Fields student accommodation scheme opens to its first intake of students as part of the brand new campus in Hulme. The BBC has reported that Birley Fields will be “welcomed with open arms” by businesses and traders when it opens. Reporter Jacqueline Paine was in the local community to sample the views of the businesses and residents for the Allan Beswick show at BBC Manchester. She found an overwhelming thumbs up, with the community excited at the boost in trade and the re-generational effects of the arrival of our dynamic education and health communities. The BBC concludes with the University’s ambition for Birley Fields to be “innovative and vibrant” and stresses that it has designed to be as open and welcoming as possible to the community. For more information on our Birley Field scheme head to the project page.